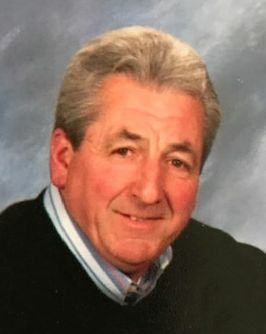 JOY, James E. “Jim”, lifelong resident of Randolph, passed away peacefully with his loving family at his side, after a long illness on March 25, 2019, at the age of 66. Born in Boston, Jim graduated from Randolph High School, Class of 1971, and was a member of the Varsity Hockey Team. At the age of 17, Jim was selected to participate in the American Sports Ambassadors Ice Hockey All Stars Tour to Ireland, England, France and Switzerland. He was the owner of Joy Construction, which he started 45 years ago and did many projects in the Boston and South Shore area. In his free time, he had a passion for hunting, fishing and the years of enjoyment at his camp in Maine. A devoted husband, father, brother, son, uncle and friend, Jim will be sorely missed by all who were blessed to have known him. Jim is survived by his beloved wife, Denise A. (Destefanis) Joy. Loving father of the late Jennifer and Andrea Joy. Devoted brother of Jean Joy of Easton and Ruth DiPietrantonio and her husband Eric of Mansfield. Son of the late James and Ruth Joy. Dear son-in-law of Lilla Destefanis of Randolph and the late John Destefanis. Brother-in-law of Diane and George Sprague of Middleboro, Linda and Frank Donovan of Stoughton, Suzanne and Gregg Connelly of Rockland and John and Linda Destefanis of Weymouth. Also survived by many nieces, nephews and friends. Relatives and friends are respectfully invited to attend visiting hours on Thursday, March 28th from 4:00 – 8:00 PM in the Cartwright Funeral Home, 419 No. Main St. (RT. 28), Randolph. A Funeral Mass will be celebrated on Friday, March 29th at 10:00 AM in St. Bernadette Church, 1031 No. Main St., Randolph. Burial will follow in Blue Hill Cemetery, Braintree. In lieu of flowers, memorial contributions may be made in Jim’s name to the Brain Tumor Center Gifts Fund, at Beth Israel Deaconess Medical Center, Office of Development, 330 Brookline Ave.-OV, Boston, MA 02215, please make check payable to “Beth Israel Deaconess Medical Center” and include Jim’s name and Brain Tumor Center Gifts on the memo line or at www.bidmc.org/give.